Is Guzaarish Sanjay Leela Bhansali�s best film to date? Has the film "GUZAARISH" lived up to your expectations? 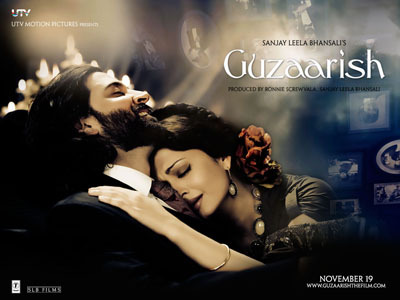 How impressed are you with Sanjay Leela Bhansali�s debut album, Guzaarish? Hrithik Roshan. Aishwarya Rai Bachchan. Sanjay Leela Bhansali. Three powerhouse names in a single film, and the potential viewer has nothing but the universe to expect for the film. And yet, there will be some skeptics who have lost faith in Bhansali a la Saawariya. The questions that now remain on the mind are: Does Guzaarish score? Has Bhansali made a gem? Do Hrithik and Aishwarya get it right again with their chemistry? 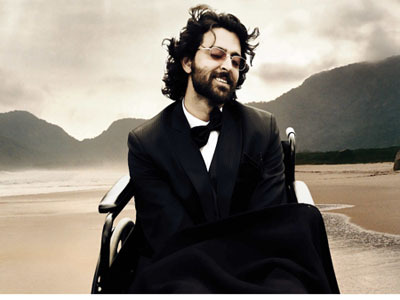 Set in Goa, Guzaarish traces the lives of a paraplegic Ethan Mascarenhas (Hrithik Roshan), once a famed magician who lost his ability to feel or work with anything below his neck level. He is now a radio show host of the program Radio Zindagi – a show that speaks about life and living it to the fullest – in an unknown radio station, and is taken care of by his nurse, Sofia D’Souza (Aishwarya Rai), who shares a strong but silent bond with him. One fine day, he calls his lawyer friend, Devyani Dutta (Shernaz Patel) and asks her to file a petition in the court for his own death, leaving Devyani and Sofia stunned. In this time, an eager magician, Omar Siddiqui (Aditya Roy Kapoor), comes into his life to learn magic – and it is here that Ethan decides to hand over his entire knowedge to him. Slowly, he learns to live, to absorb and to love… all in more ways than one! Now we all know that Bhansali films are unique in their own, regardless of how good or bad the box office collections or critical reactions may be may be. While Khamoshi is still the standpoint of his career, the only film in which he has given a glimmer of hope to see more of the filmmaker’s potential was in Black. And when Saawariya released, most felt the hope was diminished, as though it was made on a large scale, the movie was slow, and the screenplay of the story lacked punch to attract a universal crowd; hence the extremely mixed buzz for Guzaarish. In fact, many people stated that the promos and trailers of Guzaarish had a certain déjà vu from Saawariya. Guzaarish is not only different from Saawariya; in fact, here, Sanjay Leela Bhansali has finally outdone Khamoshi and has given us a moving storyline with an equally sensational screenplay (Sanjay Leela Bhansali, Bhavani Iyer), having fantastic dialogues (Vibhu Puri, Bhavani Iyer) that will sting your mind long after the movie’s over. Post Black and Saawariya, we already know that Bhansali is a fan of the bluish color tone, and here too, though it hasn’t been added in dollops, there’s just the right amount of it with subtlety all over it. Even if there’s so much pain and tragedy in display in the lives of the protagonists, each frame looks picturesque; thereby forming an ironical correlation between pulchritude and desolation. Production design and styling of the characters give the movie and the protagonists an old-world feel. Sudeep Chatterjee’s cinematography captures each frame with a hauntingly dark aesthetic that will not just seduce the viewer, but arouse a lot of curiosity in one’s mind concerning the lives and the incidents of the protagonists. Tubby and Parik’s background score is absolutely breathtaking, and one of the best since Love Aaj Kal. The score is something not to be listened, but to be experienced deep within while watching the film. Camerawork is smooth and consistent throughout, keeping the overall pace uniform. Hemal Kothari’s edit is excellent. Music by the auteur, Bhansali, himself, is terrific, and the visuals totally support the lyrics and the compositions. Moving on to the performances, Hrithik Roshan is the showstealer. Here he takes the whole movie forward with the varied emotions he exhibits, whether it’s the awkward laugh, or the tears when he cries hearing the voice of his muse Estelle after fourteen long years. His aggressiveness and the way he reacts like an excited 10-year old while touching upon matters of sexual arousal. Aishwarya Rai Bachchan gets back at her detractors like a raging tigress after the failure of Raavan, and performs stupendously. She impresses with her absolutely restrained performance, her aura and her overall controlled self. She plays the part of the nurse more like she is the nurse. The chemistry they both display, as usual, is phenomenal. Each scene they’ve shared with each other has a certain uniqueness of intensity attached to it. Aditya Roy Kapoor shines. He’s already proved himself in London Dreams and Action Replayy, and he’s continuing to do so in his own inimitable style. This guy’s got a lot of potential. Shernaz Patel is a natural. Nafisa Ali charms, even though it is in a small role. Ash Chandler enacts his part efficiently. Others are laudable. Overall, I’ll have to say that never since Khamoshi, have I seen something Bhansali has done better till Guzaarish came along. Guzaarish is easily the best film of Bhansali, and the best film of the year so far. In a year where we’ve seen a lot of masala moneymakers, the audience has always thirsted for something far different and meaningful. Guzaarish is not just those, it’s THE actual, genuine, bona fide deal. It’s food for the mind and the soul. It’s relish for each of the body’s senses. It’s well-worth the big screen experience, and is to be appreciated in a whole new way!